Pneumatic valves work in a variety of applications to control the operation of actuators, including cylinders, clutches, rotary actuators, and airbags. In the transportation industry, components operate at wide temperature ranges for buses, trains, construction vehicles, agricultural equipment and implements, and semi-trucks. A basic valve is typically manufactured with a metal or plastic body containing a sliding spool or disk. Actuated by a solenoid, air pilot or manual operator, the spool shifts to provide air flow from one or several communication ports to others. Standard valves feature general design characteristics to meet the considerable variation in standard performance requirements that is common across factory automation and heavy industrial applications. Pressure protection valves are installed on vehicles such as semi-trucks to ensure that the air brakes, which are supplied from the primary reservoir, always have adequate pressure to function normally. Response time is literally how long the valve takes to shift position. Response times typically vary between 5 and 40 msec. Cycle life equates to how many cycles the valve can operate over its lifetime, with the number of cycles typically ranging from 20 to 40 million. This assumes the use of proper filtration, such as 5 to 40 µm, so the valve and actuator receive clean air. Previously, designers basically relied on manufacturers’ spool technologies as a general rule to determine performance and cycle life. Today, valves from the major suppliers operate for tens of millions of cycles in non-lube systems; however, a majority of applications typically don’t require a cycle life of 20 million cycles. In fact, from the OEM’s point of view, the life of the valve usually exceeds the manufacturer’s warranty. For standard valves, basic temperature specifications are often considered to be in the range of –14° to 122° F, with pressures ranging from vacuum to 145 psi. Valve manufacturers choose from a combination of internal designs containing seals, spools, lubrication, solenoid components, and connections based on these temperature ranges. Once the basics are designed and tested, the manufacturer fine tunes design characteristics to limit the overall leakage factor of the valve. Unless the valve is specifically designed to be bubble tight—that is, with no measurable leakage of pressurized air—the valve will typically demonstrate some amount of leakage. Valves have different spool designs, including spools that use O-rings for a seal, spools over-molded with a rubber seal, poppers with over molded or crimped seals, and metal to metal spool and sleeve construction. Sealing surfaces and general construction can often be altered to ameliorate the leakage factor. Standard valve leakage can vary by manufacturer but typically is under 10 cc per minute. Valves are tested for leakage during factory assembly at ambient temperatures. Some standard valves can be used in “critical” applications, such as suspension control on semi-trucks. 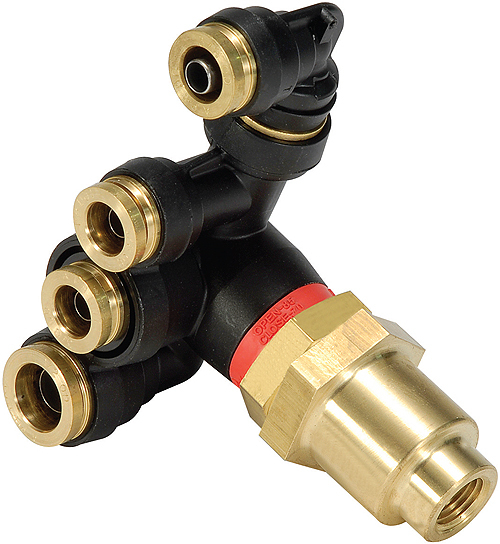 These valves can also be equipped with a unique solenoid for operation in intrinsically “safe” applications. Comments for When is a Standard Pneumatic Valve Not Good Enough?